Technologies of Wonder: Rhetorical Practice in a Digital World considers the theoretical and pedagogical implications of designing academic scholarship in interactive digital media, and proposes renewed emphasis on embodied visual rhetoric and on the canon of arrangement as an active visual practice. This project uses the concept of the Wunderkammer to argue for techné and wonder as guiding principles for a revitalized visual canon of arrangement and as new models of invention and intervention in multimodal scholarly production. Technologies of Wonder also presents examples of how this rhetoric of inquiry can be applied to multimodal projects in the classroom. New digital technologies offer viable alternatives to linear, less embodied traditions of academic scholarship. Emerging at a time when academic presses are under considerable economic pressure, Technologies of Wonder also serves as a model for how rigorous intellectual projects can be published and disseminated in less costly, more accessible formats. Please Note: This book is best viewed in Adobe Reader. Other PDF viewers may not display all of the contained media. Delagrange, Susan H. (2011). Technologies of Wonder: Rhetorical Practice in a Digital World. Logan, UT: Computers and Composition Digital Press/Utah State University Press. Retrieved from http://ccdigitalpress.org/wonder. 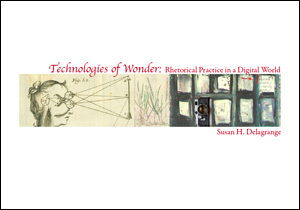 Delagrange, Susan H. Technologies of Wonder: Rhetorical Practice in a Digital World. Logan, UT: Computers and Composition Digital Press/Utah State University Press, 2011.